Green fertile fertile fields at the northern border with Kosht later become swamps and badlands. Grympen Mire is a region divided into two clear halves, clear meadows that say farewell to the daily sunset, and dark swamps with vines and trees too thick to see light for most of the day. Though the southern swamps are difficult to inhabit, farmers flock to the northern parts, where a great many crops can be harvested. It is said that below the murky waters and black mud of the swamps, there rest secrets. Hidden in the deepest parts of the dark lands, there are sinister chants that might be heard, ghostly drums that echo through the hollow trees. Though it is unknown whether any have discovered the origin of these sounds, none have returned to speak of it. Having the fertile fields to the north means that the northern peoples are mainly farmers, with the occasional traders to make quick runs to Koshtlom. However, Koshtlom is no longer the same city as it once was, and as a result, fewer traders bother making the journey. In the south, people are much hardier and segregated into much smaller units, generally composed of their immediate and extended families. Most of the southerners subsist on hunting the wild beasts of the swamps. The north enjoys regular rainfall, but also clear skies. Temperature is usually dependent on the conditions of the western ocean, though generally it is warm year round, except for winter. Grympen Mire is the buffer region between Kosht and the Ruins of Walfurgisnacht. 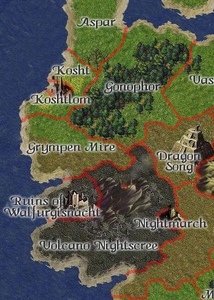 The only other region that grants access to the ruins is Volcano Nightscree, and the volcano is far more dangerous in most cases than Grympen Mire. Depending on what is encountered in the southern swamps, however, that might be disputed. This page was last modified on 3 March 2017, at 11:40.